For the Pie Dough: Place the flour, sugar and salt in the bowl of a food processor, such as a Cuisinart, fitted with a metal blade attachment. Pulse on/off to incorporate. Add the butter and continue to pulse until the dough resembles coarse meal. With the machine running, slowly add the water in a steady stream. Pulse until the dough has just come together. Be careful not to over mix. With your hands form the dough into 3 equal round flat disks. Wrap in plastic wrap and refrigerate for at least 30 minutes. For the Filling: Place a large sauté pan over medium-high heat. Add the butter, apples, both sugars, and 2 tablespoons water. Sauté for 5 minutes until apples begin to get tender. Add the cornstarch, cinnamon, nutmeg, salt and vanilla extract and mix well. Sauté until apples are tender and most of the liquid has evaporated, about 10 minutes. Remove from the heat and stir in the apple sauce. Set aside. To Assemble the Slab Pie: Place a baking sheet near your work station. Remove 1 pie dough disk and allow to warm up slightly. On a lightly floured work surface using a rolling pin, roll the pie dough into a large 14×19-inch rectangle. Carefully transfer the dough to the baking sheet, and gently press it into the corners and edges of the pan. Spoon the apple filling into the dough lined baking pan and spread out evenly. Place in the refrigerator while you work on the lattice top. Remove another dough disk from the refrigerator and allow to warm up slightly. Roll the dough out into a 16×14-inch rectangle. Working horizontally, using a paring knife and a ruler, cut the dough into 8 long equal strips about 1 1/2-inches wide. Remove the baking pan from the refrigerator and transfer the 8 long strips to the pie, placing them very close together so there is almost no space between them. Allow the edges to hang over or fold the end underneath if very long. Place the pie back in the refrigerator to rest. Remove the 3rd dough disk from the refrigerator and allow to warm up slightly. Again, roll out the dough into a 16×14-inch rectangle. Using a paring knife and ruler, cut the dough vertically this time into 10 equal strips about 1 1/2-inches in width. Remove the pie dough from the refrigerator. Place the baking pan horizontally in front of you with the two shorter sides on the ends. Working with one strip at a time, starting on the left, lay the first strip down on top and gently weave the strip in and out of the longer strips working your way from the top to the bottom and left to right, as seen on the photo above. This will take some time, so be patient. Repeat this process with the second strip directly next to the strip you just weaved, leaving very little space in between. Repeat until the whole pie has been covered. Once the strips are all in place, gently tuck the remaining overhanging dough underneath itself. Use a fork to go around the crust and gently crimp. Place the pie in the refrigerator to rest for a few minutes. For the Glaze: While the pie is chilling, in a small mixing bowl add the egg and heavy cream and mix well. Set aside. 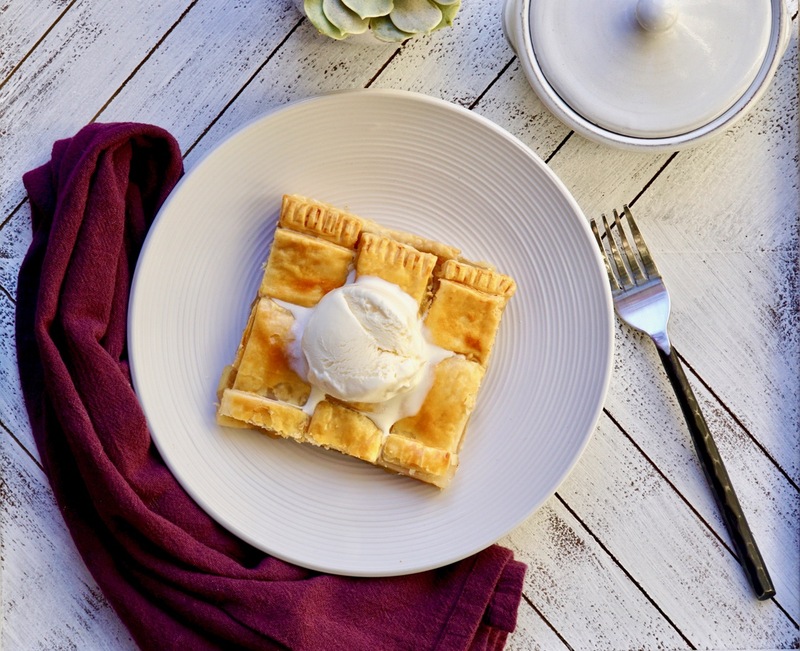 Remove the pie from the refrigerator and using a pastry brush, gently brush the pie all over with the glaze. Place in the oven and bake for about 45 minutes, rotating once, until golden brown all over. Turn off the oven and allow to sit for an additional 5 minutes. Allow the pie to cool completely before slicing. 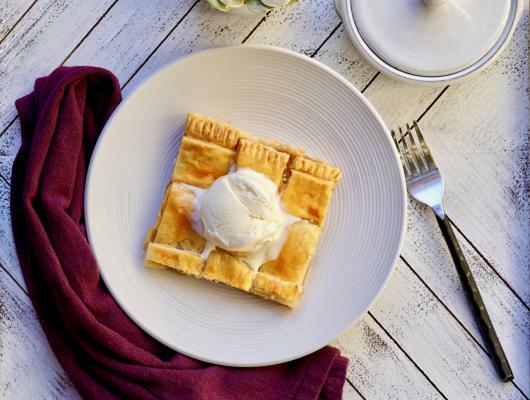 Thanksgiving can be overwhelming, keep it simple with this delicious apple slab pie. With homemade or store bought crust, this dessert is a winner.